This Student Workbook is an accompaniment to The History of the Church: Semester Edition; it allows the student to understand how God sent the Holy Spirit to act through the Church and her members through compelling and meaningful exercises. Using combinations of multiple choice, fill in the blank, and short answer questions, the students recall and apply concepts from the textbook to their own lives. The textbook, The History of the Church: Semester Edition, corresponds to Elective B: History of the Catholic Church in the curriculum framework. The textbook (sold separately) is an abridged edition of the same title in the Didache Complete Course Series. 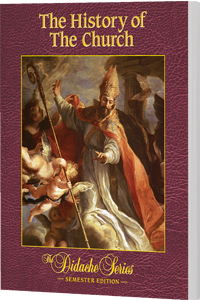 That edition has been granted ecclesiastical approval from the Archdiocese of Chicago, and it has been granted conformity with the Catechism of the Catholic Church by the USCCB Subcommittee on the Catechism.